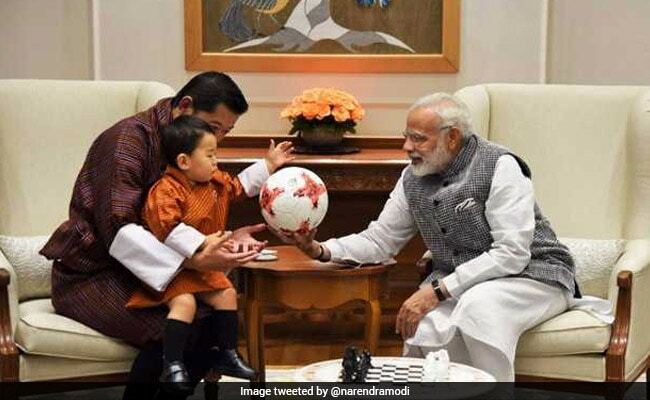 New Delhi: Prime Minister Narendra Modi on Wednesday gifted an official football from the FIFA U-17 World Cup to the young prince of Bhutan. King of Bhutan Jigme Khesar Namgyel Wangchuck, the queen and their son arrived in New Delhi on Tuesday on a four-day visit. "Presented the Prince of Bhutan an official football from the FIFA U-17 World Cup and a chess set," PM Modi tweeted. He said he had a wonderful meeting with the three visitors. India and Bhutan have also agreed to celebrate 2018 as the golden jubilee of the establishment of formal diplomatic ties between the two neighbours, a statement by the Bhutanese Embassy said. President Ram Nath Kovind, during his meeting with Bhutan King Jigme Khesar Namgyel Wangchuck, invited to him on a state visit to India during the golden jubilee year, which was accepted by the visiting dignitary. "The meetings were held in a very warm and cordial atmosphere, reflecting the spirit of mutual trust and understanding that characterise the exceptionally friendly ties between the two countries," the statement said. Earlier on Wednesday, President Kovind "conveyed deep appreciation for the King of Bhutan's personal involvement and guidance and the support provided by Bhutan in addressing the recent situation in the Dokalam area," the statement said. Indian and Chinese troops had been locked in an over two-month-long standoff in Doklam, a tri-junction between India, Bhutan and China, after Indian troops stopped the Chinese from building a road in the plateau. Mr Wangchuck also held talks with PM Modi and External Affairs Minister Sushma Swaraj. Recalling the "unique and historical ties of friendship and understanding" between India and Bhutan, the leaders exchanged views on bilateral cooperation as well as other issues of mutual interest. The two sides expressed satisfaction at the "excellent state of bilateral relations" and reaffirmed their commitment to advance the good ties across diverse sectors of cooperation. "The visit of Their Majesties to India marks an important milestone in the close and friendly relations between the two countries and has contributed significantly towards further strengthening the profound friendship between India and Bhutan," the statement added.